The use of artificial intelligence in product development and corporations is growing significantly. Repetitive tasks will no longer be done manually. With the help of AI we'll be able to automate even the cognitive tasks to a certain extent. If every enterprise small and large can automate most of their tasks, then what could be the factors of a competitive advantage? In this rapidly evolving market, having a high performing, adaptive and innovative teams will be a competitive advantage for any organization. Scrum Framework specifically identifies Scrum Master as a role that is responsible to create high performing, Agile teams. A Scrum Master who is able to help build high performing and innovative Scrum teams, and coach people can be a valuable asset for the organization. Can the AI replace the ScrumMasters? Can AI products develop Scrum Master skills and perform the tasks and responsibilities of a Scrum Master? Well, to a certain extent. Those Scrum Masters who only perform mundane tasks, write meeting minutes, create reports and enter data in the electronic tool will see themselves get replaced by AI bots soon. I think irrespective of the technological advancements there will still be a need of skilled Scrum Masters. An effective Scrum Master can help Scrum Team deliver results that are an order of magnitude better than mediocre Scrum Teams. Though the responsibilities of the Scrum Master may adjust with the time. Great Scrum Masters will definitely contribute towards improving the business agility and helping organizational system as a whole. The real-world challenge I see most organizations face today with the role of the Scrum Masters is - Developing Scrum Masters that have the required competencies and skills to perform the job well. Most Scrum Masters underperform due to lack of full range skills. 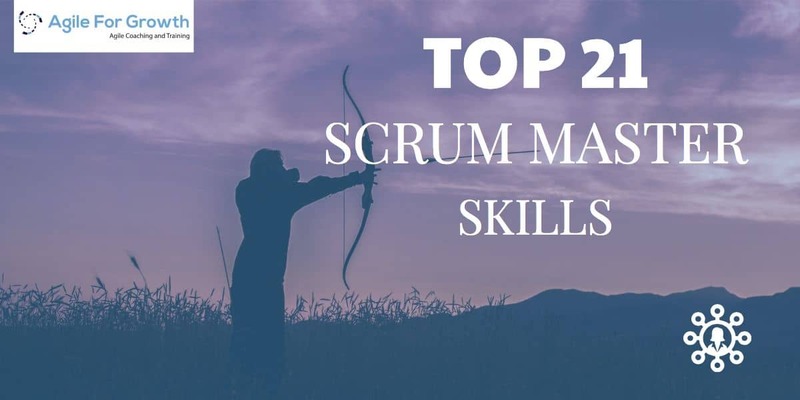 Below I list top 18 Scrum Master skills that'll be essential for Scrum Masters to stay effective even in 2020. 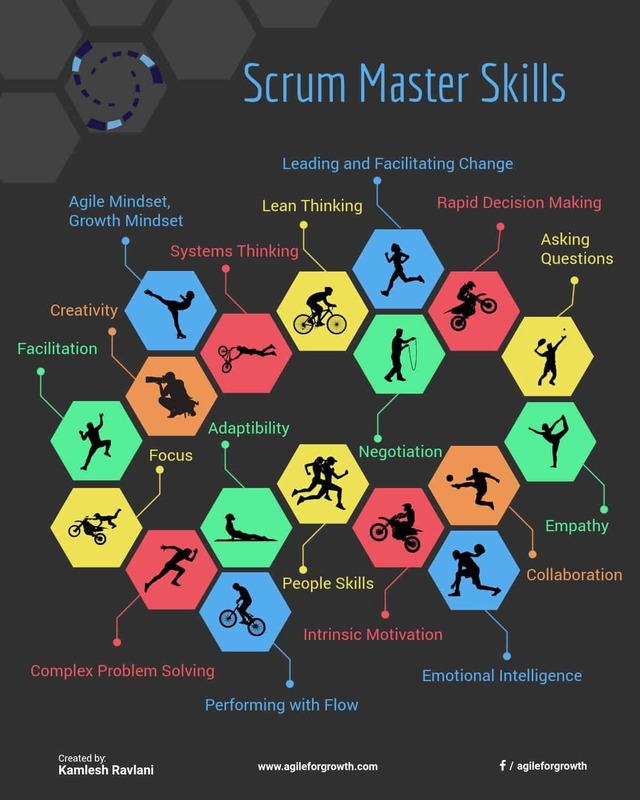 I also invite you to contribute 3 top Scrum Master skills that should be part of this list. Systems Thinking: Ability to see the interplay of various components and resultant overall system. Helps avoid local optimization and enables the Scrum Master to take a holistic view of the complete organization as a system. Adaptability: This skill is at the core of being an effective Scrum Master. If the Scrum Master can herself adapt swiftly to the changing organizational system, and team's needs, she will be able to inspire the same behavior within the team. People Skills: Interpersonal skills are essential skills for a Scrum Master to be able to deal with the different personalities and demands of the team members, the PO, and the stakeholders. Bots will not be able to understand the complex human behavior in near future to be able to deal with it effectively. Complex Problem Solving: Product Development involves various elements that dynamically change and create complexity. Scrum Master must be able to handle complex situations and address problems in the complex domain. One example is when dealing impediments caused by external teams not directly known to the Scrum Team. Lean Thinking:Most organizations have processes and policies full of waste. The Scrum Master must develop this skill to observe and help the team identify + remove any waste in the process and create lean approach to develop and deliver customer value. Agile Mindset, Growth Mindset:Setbacks and failures are part of the game when trying new ideas and conducting experiments. The Scrum Master must teach the team to accept failures and encourage them to keep learning from the experiments. 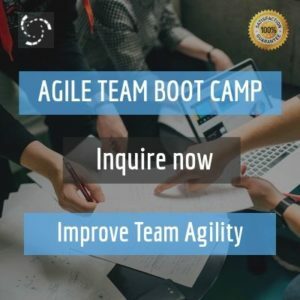 Adapting Agile Mindset sets the Scrum Master in a position to be able to help the Scrum Team. Creativity:The Scrum Master must become creative when helping the team solve impediments, designing Sprint Retrospectives, bringing change ideas, etc. The SM helps the Scrum Team utilized creativity to explore the uncharted territories and to experiment creative product/market ideas. The iterative and incremental approach of Scrum maximizes feedback and minimizes risk, the Scrum team's intense collaboration makes the team environment conducive to creative ideas. Empathy:The ability to understand the other person's situation and show them that you care. Asking Questions:More damage is done by Scrum Masters telling the team what to do and giving them the answers. An effective Scrum Master may empower the team to think and solve their challenges. It takes years of deliberate practice to move from telling and to move to asking questions. With practice, the Scrum Master can develop the skill to ask powerful questions. Collaboration:Before the team accepts your advice to collaborate, they'll judge if you collaborate with your peers and other Scrum Masters within the organization. Facilitation:The skill to facilitate meetings, decision making and facilitating change is the most common skill every Scrum Master must develop. Rapid Decision Making:The Scrum Master must develop the skill to be decisive. The empirical approach of making decision empowers the SM to rapidly make decisions based on what is known. Transparency promotes rapid decision making and the Scrum Master ensures the artifacts are transparent. It is important that the Scrum Master teaches the development team and the Product Owner to make fast decisions and avoid analysis paralysis to ensure a working product increment is delivered every sprint. Leading and Facilitating Change:The Scrum Master must develop finesse in leading change. Inspiring the team members to continuously improve their processes and practices requires excellent facilitation skills + inspiration. The Scrum Master is a change agent that guides the Scrum Team and the Organization on their journey to improve Agility, learning, and growth. The Scrum Master gets everyone's buy-in to make the change and ensure the change is positive in nature. Focus:Enterprises are full of distractions. The Scrum Master has to be intentional in avoiding the distractions to be able to stay focused on working on the highest value tasks. The SM also teaches the development team to stay focused on their Sprint plan to accomplish the Sprint goal. Performing with Flow:Staying focused can help the Scrum Master work on the highest impact tasks. The Scrum Master must keep challenging herself as well as the team they coach to handle increasingly challenging goals. The satisfaction of accomplishing bigger and complex goals adds further momentum and helps the Scrum Master perform with the flow. Negotiation:Creating a win-win situation is the only way to win in the long term. Negotiation is also termed as Interpersonal decision making. The Scrum Master should facilitate such decision making among the Product Owner and the Development Team, the PO and the Stakeholders, and the Scrum Team and the leadership. You miss this skill and you'll see that the team is being asked to work on more user stories than they can pick. The Product Backlog size is ever increasing. Intrinsic Motivation:Developing a high level of interest and staying fully engaged in the tasks at hand is the responsibility of every individual as a professional. If the Scrum Master is able to connect with a purpose and perform with the flow, she is further able to develop intrinsic motivation. The motivation that is not dependent on external rewards, bonuses or recognition. The Scrum Master is able to drive meaning from the work and remains motivated to handle complex challenges. Emotional Intelligence:The ability to self-regulate, be self-aware and socially connect with the team members at a deeper human level allows the Scrum Master to build a long-term relationship and create a healthy work environment. Due to the rapidly changing nature of complex work that requires intense collaboration among the entire team, it is important that the Scrum Master is adept at emotional intelligence. Which Skill should be listed? I need your opinion to add 3 top Scrum Master skills that'll be valuable in 2020.